Do you like recipes that let you literally throw the ingredients into a pot and walk away? Do you also like recipes that taste as though you have spent hours in the kitchen cooking up a storm? If you said yes, this recipe is for you! There is nothing better than coming home from a long day at work and enjoying the benefits of a simple, home cooked meal. This Simple Slow Cooker Vegetarian Green Split Pea Soup is really a warm, comforting and satisfying soup that is a perfect fit for the cozy sweater weather we have been having. Come and take a look at how you too, with a net investment of fifteen minutes, can be enjoying a weeknight meal which is healthy and hearty. An initial investment of just fifteen minutes is required to get the vegetables chopped. 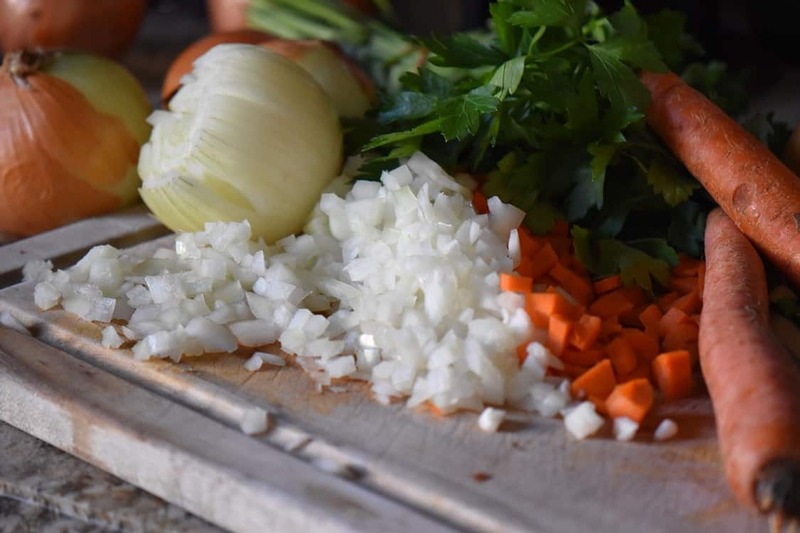 The usual culprits, referred to as “the holy trinity” or mirepoix, are required to make this soup. Naturally, we are referring to onions, carrots and celery. Be sure to include some celery leaves when making this soup as this is a great flavor enhancer. there are convenient to use as there is no need to presoak. cooking the peas with a source of acidity, such as tomato sauce, wine, lemon juice or vinegar. If using, it is best to add these towards the end of the cooking time. 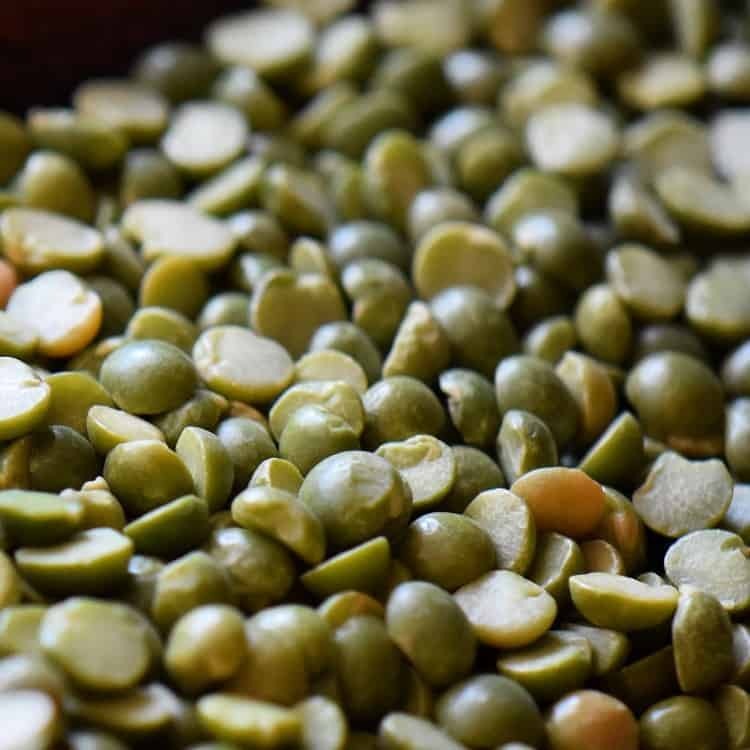 Although these split peas can generally be cooked within 1-2 hours (when using the stove top method), a longer simmer will ensure the complete breakdown of the split peas. You can well imagine that since we are using a slow cooker, you will be rewarded with a wonderfully creamy texture. In fact, this Simple Slow Cooker Vegetarian Green Split Pea Soup gets even more creamier and thicker when consumed the next day. So, once you have properly rinsed and sorted the peas, add them to you slow cooker along with the rest of the ingredients. Put the lid on your slow cooker and forget about it for the next 6 hours or so. But where is the ham? Traditionally, a split pea soup includes a ham bone. I assure you that this pea soup is fantastic with or without the addition of the ham. If you prefer, feel free to just add it to your slow cooker along with the rest of the ingredients. If you have one, a leftover ham bone also works really well in this slow cooker soup recipe. 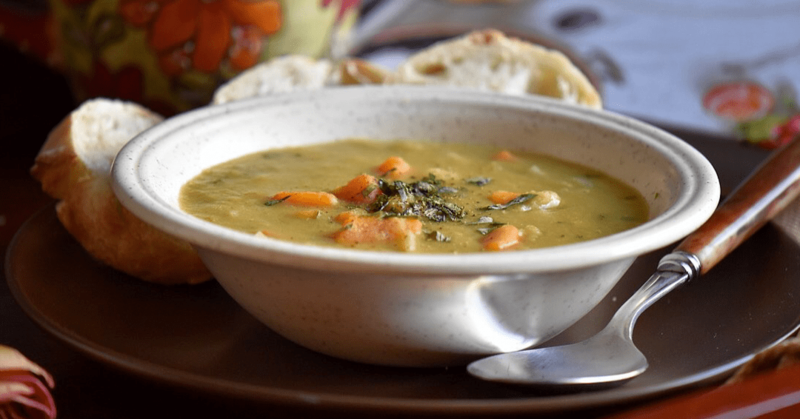 Leftovers: You will find that this Simple Slow Cooker Vegetarian Green Split Pea Soup recipe will make a lot of soup -and who doesn’t like the convenience of leftovers? Just reheat and enjoy. Leftovers can also be frozen. A few decades ago, I purchased a cookbook called “The Laura Secord Canadian Cookbook” at a second hand bookstore. The original pea soup recipe can be found on page 158 in this classic cookbook. Needless to say I was immediately intrigued by so many traditional Canadian recipes. If you recall, I have already shared this Traditional Quebec Maple Syrup Poached Eggs Recipe with all of you. Who can resist a poached egg in maple syrup, especially in Quebec? I always felt like this was the best traditional pea soup recipe. My belief was recently confirmed by none other than Canadian food icon, Elizabeth Baird. I had the privilege of hearing Ms. Baird share her knowledge and passion of Canadian food history at the 2017 Food Bloggers of Canada conference where Ms. Baird was the keynote speaker. At this conference, I learned that the two most important recipes developed in Canada are butter tarts and carrot pudding. It was during this conference that Ms.Baird mentioned that the best pea soup recipe was in this cookbook. 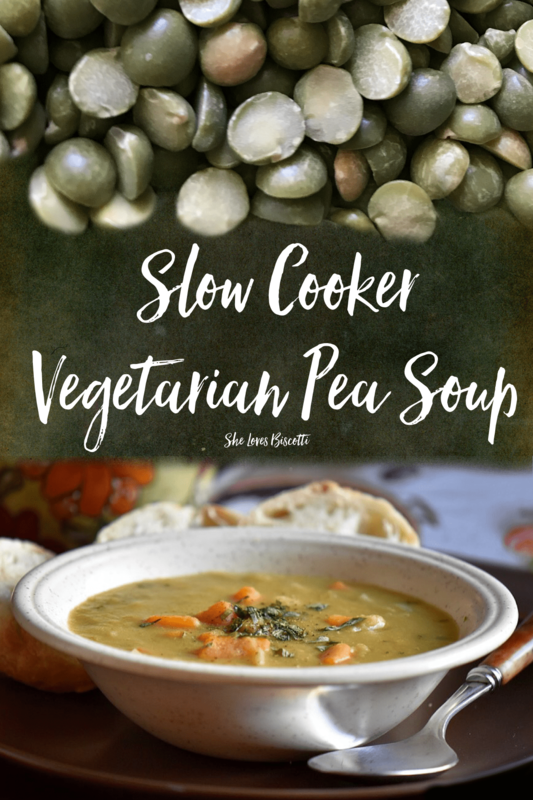 I have adapted the recipe by reducing the amount of liquid and eliminating the ham bone in order to make this version of a Simple Slow Cooker Vegetarian Green Split Pea Soup recipe. This large healthy bowl of comfort food is waiting for you. 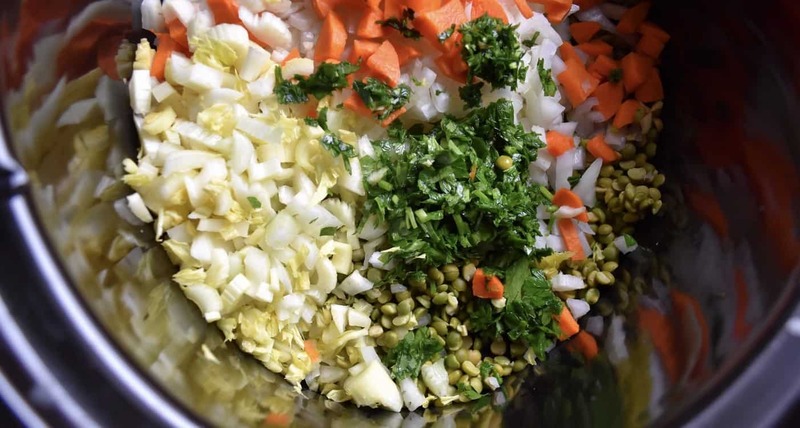 ★★★★★ If you have made this Split Pea Soup, I would love to hear about it in the comments below and be sure to rate the recipe! Soup's on! 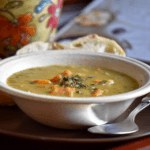 It's the season to enjoy this Simple Slow Cooker Vegetarian Split Green Pea Soup. Grab your favorite book and come enjoy a big bowl of comfort. Add all of the ingredients (except the savory) in a slow cooker. Cover and cook on high for about 6 hours or until the split peas are thoroughly cooked. Add the savory. Season to taste and serve. Start with 8 cups of of vegetable stock; toward the end of cooking, you may need to adjust the thickness of the soup. There may be some slight variations of total cooking time based on the type of slow cooker you have. Could you please let us know approx how many cups of onions this is? I find you can buy them in such different sizes so it’s very hard to judge! Thanks! Oh you had me at savoury, its one of the most underrated herbs. I will definitely be dusting off my slow cooker to try this soup…I love a good soup and this one looks incredibly yummy. Perfect to cozy up with in front of a roaring fire! Thank you for this week dinner idea ! Perfect timing ! This sounds delicious and I love that it only takes a few minutes to prep. Perfect for busy weeknights. Pinning!! Hi Maria, I remember the first time I had split pea soup. When I first looked at it I honestly said yuk. I was quite young, then my uncle said close your eyes and just taste it. I could not believe the flavor, I loved it and from that day on there was never a time that when split pea soup was offered that I didn’t deny myself some. I have to say I was alone in my class of friends, but I reassured myself knowing that I was truly a foodie and they didn’t have a sophisticated pallet as I had. Thank you for sharing this, Brought back some amazing younger memories.